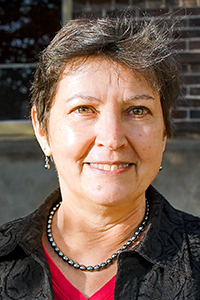 Pat Curtin joined the SOJC faculty in 2006 as professor and Endowed Chair in Public Relations after teaching for 10 years at the University of North Carolina at Chapel Hill, where she directed the master’s and doctoral programs. She is the author of two books on international public relations practices and has written numerous articles for peer-reviewed publications that expand public relations theory into critical/cultural and postmodern approaches. She is the former head of the Public Relations Division of the Association for Education in Journalism and Mass Communication and was book review editor for five years for the association’s flagship journal, Journalism & Mass Communication Quarterly. She is the former chair of AEJMC’s Standing Committee on Research and is currently serving as an elected member of the Standing Committee on Publications. In spring 2005, Curtin taught communication classes on the Semester at Sea program, leading experiential learning field trips in Asia, Africa, and South America. Prior to obtaining her doctorate, she worked in public relations for 13 years, including running her own firm. She has served on multiple international and national site assessment teams and has won awards for her research, teaching, and service. Curtin’s major research interests are critical approaches to cross-cultural public relations theory and agenda building in new media environments.